In the UK, there are approximately nine million dogs and almost eight million cats – with around one in two households owning a companion animal. This large pet population is estimated to consume billions of tonnes of meat each year. So, given that more people are trying to do their bit to help save the plant and keep meat consumption to a minimum, it’s not surprising pet food has become the latest sector to think about its environmental credentials. Pet food trends tend to lag human dietary trends by around 12-18 months. And there are now many opportunities for dogs or cats to eat a vegetarian, vegan, gluten-free, low-allergenic or super-food diet. Then there is also a big market in “raw foods”, which have becoming increasingly popular. These are comprised solely of premium human-grade meats, raw fruits and vegetables – and are unrefined and minimally processed. Made from 100% insect protein, grain-free, low allergenic potential, sustainable and an environmentally friendly delicacy for the modern canine household. The domestication of canines has allowed their systems to adapt to be better at digesting starch – found in grains, beans and potatoes – than their wolf ancestors. This adaptation probably allowed the domestic dog to flourish on human grains and cereals. Their gut microbiome has also adapted to be better at breaking down carbohydrates and to some degree is able to produce amino acids normally sourced from meat. Dogs are true omnivores – they can survive on both plants and animals – unlike their carnivorous ancestors. Read more: Vegan dogs: should canines go meat free? Our domesticated feline friends on the other hand, remain obligate carnivores – much like their larger and wilder ancestors. Cats still require many essential nutrients that can only be obtained from eating meat. Responsible manufacturers of pet foods describe their products as “complete” if they meet all nutrient requirements for a dog or cat, according to established guidelines. Ideally, they register with the Pet Food Manufacturers Association to guarantee their product is in accord with certain standards. Wet pet foods – such as tins, pouches, trays – are fed to approximately 41% of dogs and 77% of cats in the UK. Each is more often than not labelled as being a “meaty flavour” – such as beef, lamb, poultry, duck. The actual amount of meat in the feed varies according to the stated claim on the label – anything from 4% to 60% is common. These foods contrast steeply with the market-leading dry “kibbles” that are ultra-processed and ultra-refined – and account for 85% of all pet food sold. 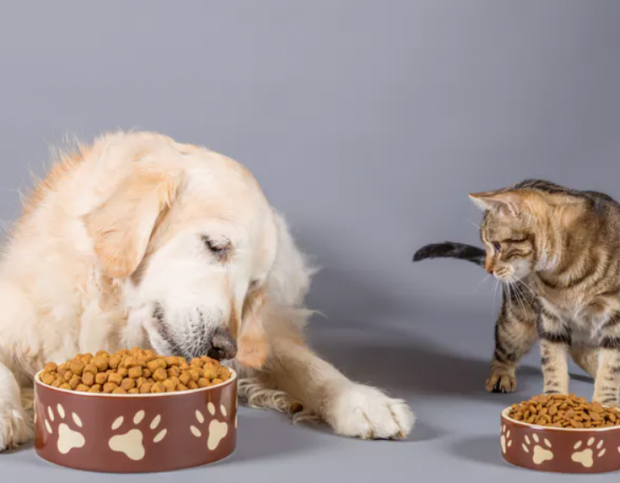 The environmental impact of pet food in the US alone is estimated to be around 60 million tonnes of CO₂-equivalent methane and nitrous oxide production per year – which is a huge amount. So could insect-based pet food be the answer? A first in the UK, Yora now offers a product with sufficient protein to satisfy our favourite companion animals and one that also has eco-credibility. Other manufacturers have also entered the fray with a few insect-based pet foods available online. On its website, Yora claims that the resources needed to produce just 10kg of protein from beef are 2,100 m² of land – which generates 1,500 kg of greenhouse emissions and uses 1,120,000 litres of water. Considering equivalent values to produce 60kg of insects used in its products are 45m² of land and 54,000 litres, then it’s clear that Yora could be on to something. But independent studies into such products are now needed to really conclude if the nutritional impact weighs up. Of course, it isn’t just pet food that comes under question for it’s environmental credentials. With an expanding global population, nutritional scientists have, for many years, been considering how to produce sufficient quality protein from more efficient sources. At the University of Nottingham, for example, academics are working on a range of projects evaluating the use of insects as both human food and animal feed. One of the major challenges though is what to feed the insects – plant and animal waste have been considered. It would defeat the object if they were fed foodstuffs more usually consumed by humans or farm animals – and kept in heated greenhouses. Of course, cynics might say the answer is to reduce pet ownership altogether. But it’s important to not forget the positive impact that pets can have on people’s lives. Dog ownership increases activity levels and social interactions and lowers risk of premature death . Having a family pet also reduces the chances of a child in that house becoming asthmatic – by exposing their immature immune system to novel antigens at an early age. Research shows that owning a cat can also make you happier. Our feline friends can help to reduce stress levels – along with our blood pressure – and help to make us feel less lonely. So despite the environmental impact of what they eat, the fact remains that pets are good for us. Perhaps now with increased choices on pet food, owners can make more informed, ethical decisions. And the industry could also help by labelling foods with an indication of how environmentally friendly a product is.